By Robin Darwall-Smith Written for the the Oxford Bach Choir members’ bulletin and reproduced here with kind permission. In a year that marks the centenary of the outbreak of the First World War, the Oxford Bach Choir is performing Elgar’s own reflection on that conflict, his great choral work The Spirit of England. Its title may have led people to fear an ephemeral piece of jingoist flagwaving, but the truth is very different. I will stick my neck out here and say that I think that The Spirit of England is one of Elgar’s greatest works in any genre, and I hope that all of you, whether or not you already love Elgar’s music, will find that you are in for a special musical experience. Spirit of England is an unusual work in that both words and music were written the middle of a war, and it lets us into the emotions felt by Britons on the home front, impotent to do anything, fearful of loved ones, uncertain of the future, and yet hopeful of eventual victory. One important thing to bear in mind is that, in early performances of this piece, every member of the choir, orchestra, and audience will have known someone close to them who was serving in the armed forces, and, especially in the latter days of the war, most of them will have known someone who had been killed. Age shall not weary them, not the year condemn. Elgar therefore set to work. He selected three poems from The Winnowing Fan out of which to create a halfhour cantata which would chart the emotional journey of the war to date. We therefore start with The Fourth of August, which represents the excitement and apprehension which greeted the outbreak of hostilities. The other two poems swiftly leave that world behind to consider the emotional cost of war. To Women reflects on the feelings of women with loved ones serving on the front, and their uncertainties and fears, while For the Fallen, the longest movement of the three, is a great elegy to the dead themselves. Vampire of Europe’s wasted will. Elgar, like many Britons, was steeped in German culture. His own music owed a great deal to German influence, and he had visited Germany regularly. He had also been encouraged and helped by many Austro- German musicians. It was, at least early on, impossible for Elgar to demonise a nation which he had loved so well. In fact the overwhelming mood of The Spirit of England, especially in its second and third movements, is one of a deep compassion in the face of unimaginable losses and suffering, and there is very little militarism about it. In the third movement, when Binyon imagines fallen warriors as they marched off to war “open-eyed and unafraid”, Elgar certainly sets these words to a march, but it is an eerie and ghostly episode. Instead the emotional core of the work is at the end when Binyon compares our memories of the fallen to the stars above, and Elgar rises to a deeply moving and ecstatic climax (sufficiently ecstatic for Elgar to give the first altos a top G sharp at its height: you have been warned), before dying away to nothing. The Spirit of England ends quietly and uncertainly: a reflection of Britain’s mood in the middle of the war. Even after the war, however, Elgar was in no mood to celebrate. Laurence Binyon wrote an Ode to Peace, which he invited Elgar to set, but Elgar was not interested; instead he wrote the Cello Concerto. It has always seemed to me to have in its opening bars a personal tenderness and grief, in the grotesque march an agony of distortion, and in the final sequences a ring of genuine splendour. The Oxford Bach Choir performance of The Spirit of England will take place in the Sheldonian Theatre, Oxford on Dec 6, 2014. Several recordings of The Spirit of England can be found, for example on YouTube. More information about the composer Edward Elgar, the poet Laurence Binyon and his Ode of Remembrance can be found in Wikipedia. 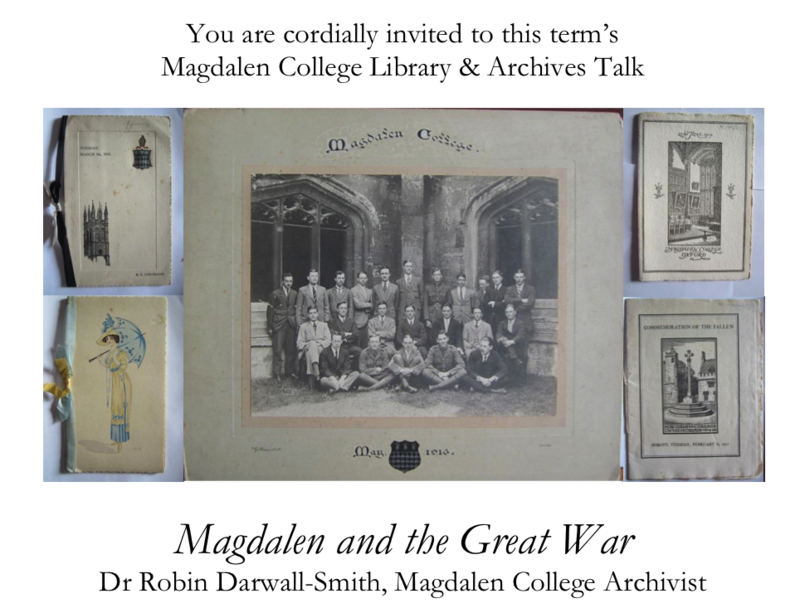 This term’s Magdalen College Library & Archives Talk will feature Dr Robin Darwall-Smith, Magdalen College Archivist, talking about ‘Magdalen and the Great War’. College, and among the themes he will consider are: the College in the summer of 1914; how Magdalen functioned during the war and who was there during this time; what happened to its members on the front; and how the College chose to remember the war afterwards. Including a chance to see a related exhibition in our Old Library, which was curated by Robin and our Archives Assistant, Ben Taylor.